The Escolapian College in the early 20th century. José Guerrero’s childhood was poor but happy. Subject to the vagaries of life that early 20th century Spain held for those of humble condition, in just a few years the boy José lived at several addresses (Horno de Haza, 1; the corner of Molinos and Visitillas; Chite, his mother’s home town while his father was in Cuba and Horno de Abad, 13) and attended three different schools: the Graduate School on Gran Capitán (1920), the Protestant college on Tendilla (where he was a pupil for a short time in 1923) and, finally, the Escolapians, from 1923 until 1928. Guerrero’s father, Emilio García López (born in Loja and a chauffeur by profession) died on January 9th 1929. The difficult situation in which the family was left forced José to leave school at the age of 14 and find work. Gracia Guerrero Padial, the artist’s mother, was to die many years later, on January 12th 1976, also in Granada. Emilio García López, father of José Guerrero. 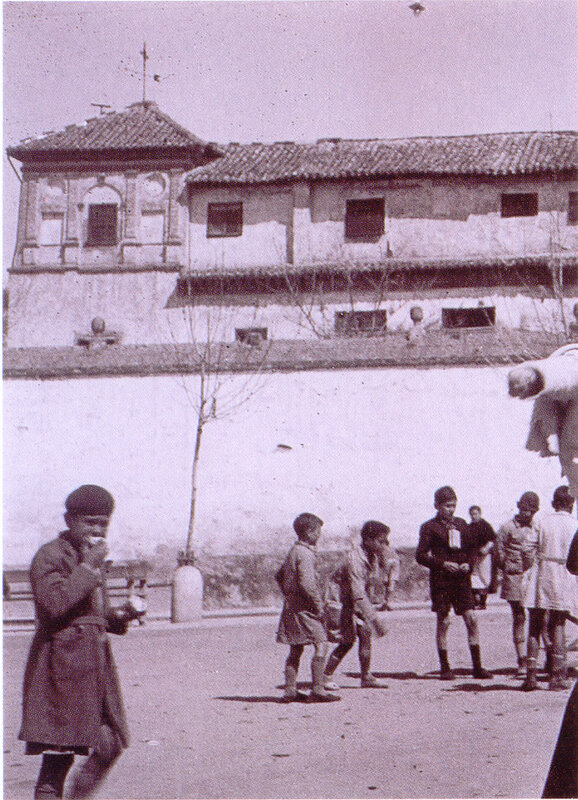 Children playing on Plaza de los Lobos, Granada, 1920’s. To fulfil his family obligations, young José first began work in a carpenter’s workshop on the same street where he lived, Horno de Abad. Being skilful with his hands, he soon moved to the business of Juan Martínez Herrera, where he was employed as an apprentice wood carver and found receptive, even stimulating surroundings for his abilities. Some years later, in 1934, he was to work in two other businesses – an electrical workshop and the San Antonio chocolate factory. On January 8th 1931, his elder brother Emilio died and, that same year, his employer Juan Martínez Herrera advised him to study drawing in view of his skills. Following this advice, José began to attend evening classes at the Arts and Crafts School. This was where his artistic vocation truly came alive, particularly under the influence of the History of Art classes (taught by Ricardo Agrasot), as well as his friendship with Bernardo Olmedo, another pupil at the school. During his early youth, then, between the ages of 17 and 20, Guerrero combined his work at the carpenter’s shop with his classes, as well as beginning to paint on his own. He left the Arts and Crafts School after a much talked about confrontation with the teacher Gabriel Morcillo in 1934. 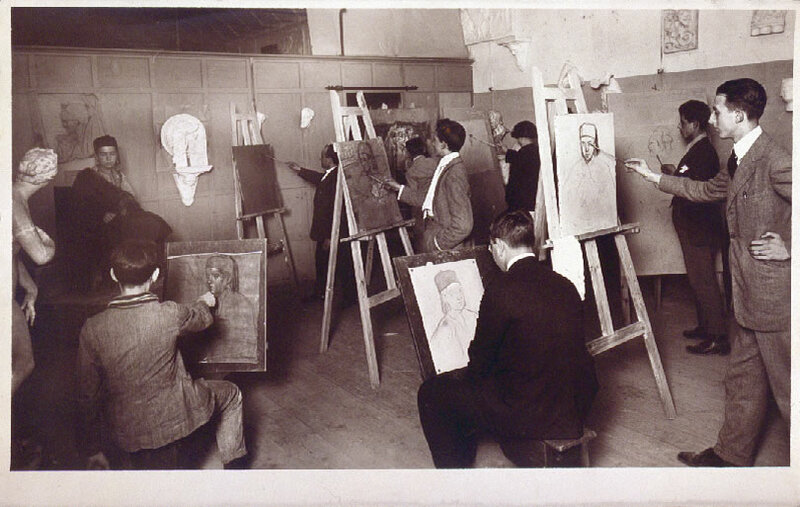 Gabriel Morcillo’s drawing class towards the end of the 1920’s. 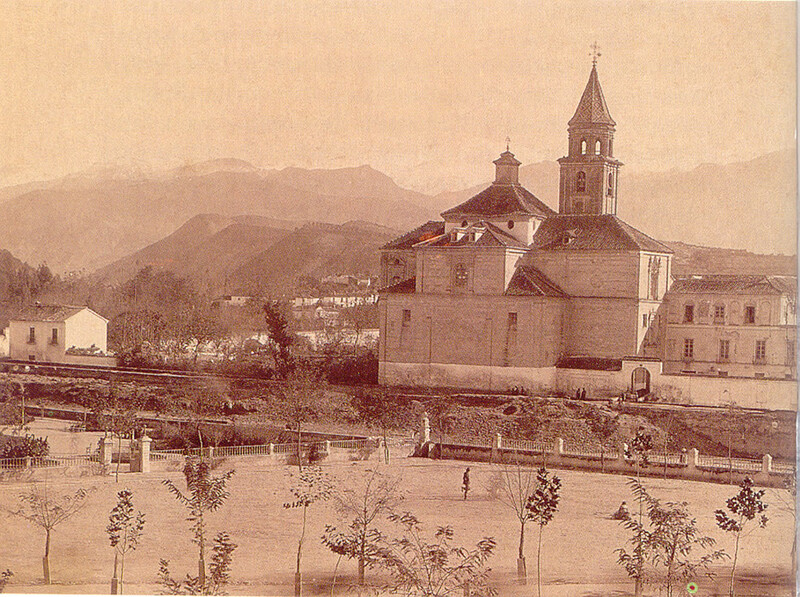 Bell tower in Granada Cathedral, 1931. 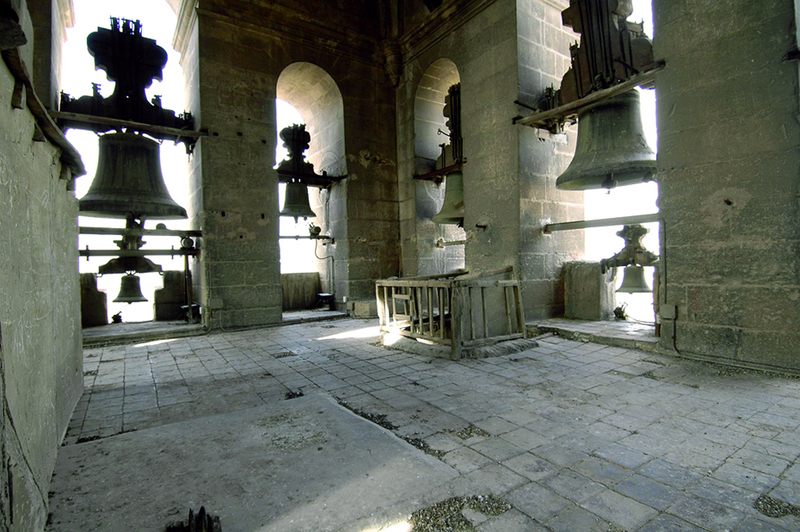 His fellow apprentice, Santiago Martín López, was the son of the bell-ringers in Granada Cathedral and he knew that three centuries before, a studio had been set up in the bell-tower for Alonso Cano himself. He therefore arranged for it to be lent to José, who in return for its use only had to ring the bells when told. This allowed him to dedicate all the time he could get away from work to learning to paint. 1935 was one of several mixed years for José, for although it began with a dazzling opening up of horizons as he became more involved in the centre of the city’s cultural life, it close with his leaving under the obligation of fulfilling his military service. 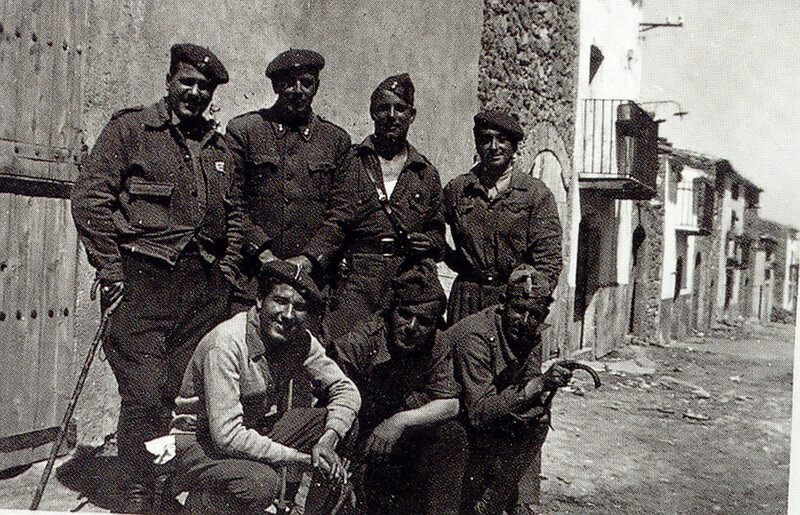 The 1936 uprising found him stationed in Ceuta. José spent the war on various battlefronts drawing panoramic views, in other words, open spaces. This was something he would later emphasize when reminiscing about the war. For him it was associated with wandering and the contradictory effects of his military duties, that is, the landscape and his synaesthetic experience, to which must be linked the knowledge of the underlying Horror, that he occasionally referred to as the “cries in the night”. Guerrero during military service in the mid-1930’s. 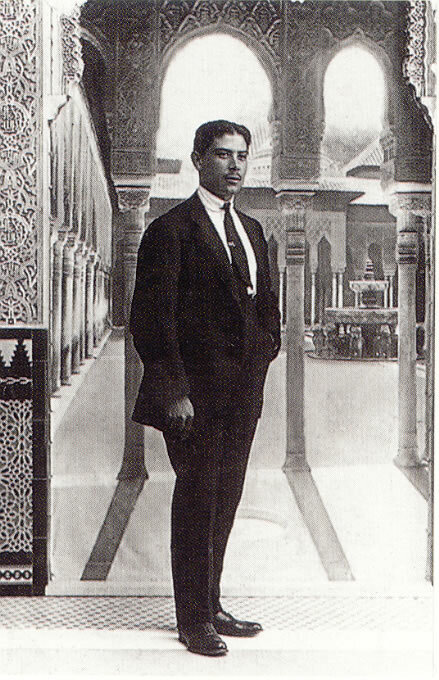 After his discharge in Mataró in 1939, Guerrero returned to Granada, but immediately decided to go to Madrid to pick up his art studies once more. He took several jobs to help him save, but what finally allowed him to go to the capital was the sale of a number of paintings to the Duchess of Lesera in 1940. He left, then, for Madrid, and began by going to live in his aunt’s house on at number 4, Calle Zurita and he enrolled at the San Fernando Higher School of Fine Arts. Here he was particularly interested by the classes of Vázquez Díaz and Lafuente Ferrari (History of Art again). His academic record shows five prizes and a first-class honours in Drawing and Colouring and Composition. On the personal side, he developed friendships with Carlos Pascual de Lara, Miguel Pérez Aguilera, Antonio Lago and Antonio Lorenzo. He found a means of earning his living by painting billboards for a cinema on the Gran Vía and he spent the summers painting in Granada. 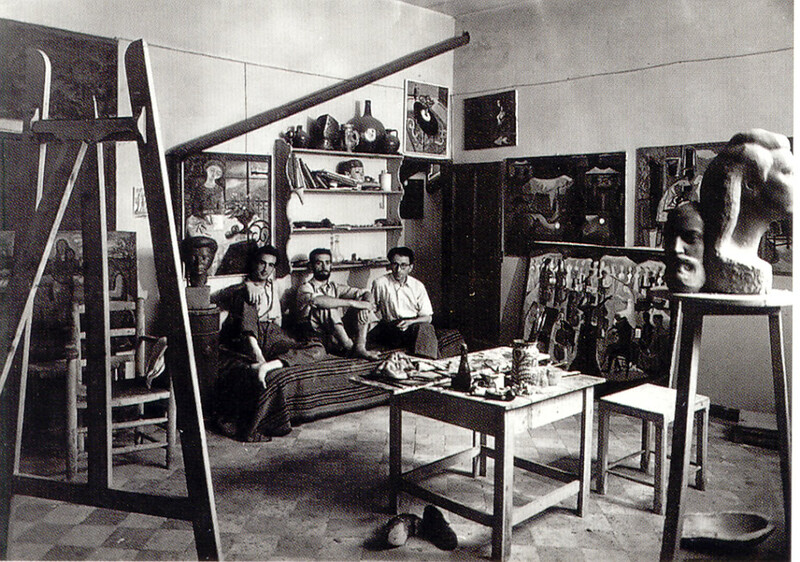 Carlos de Lara, Antonio Lago and Bernardo Olmo in Lara’s studio, Madrid, in the mid-1940’s. From 1942 to 1946 he lived in the Casa Velázquez of Free France (then on Calle Serrano) thanks to its Director, the Hispanist Maurice Legendre, who was to be great protector as well as a friend. Legendre introduced him to many people, including Juana Mordó, and also spoke most favourably of his to Gallego Burín in 1944. The institution he directed, the Casa Velázquez, gave the painter use of a studio on Calle Padre Damián, which Guerrero decided to share with Antonio Lago. 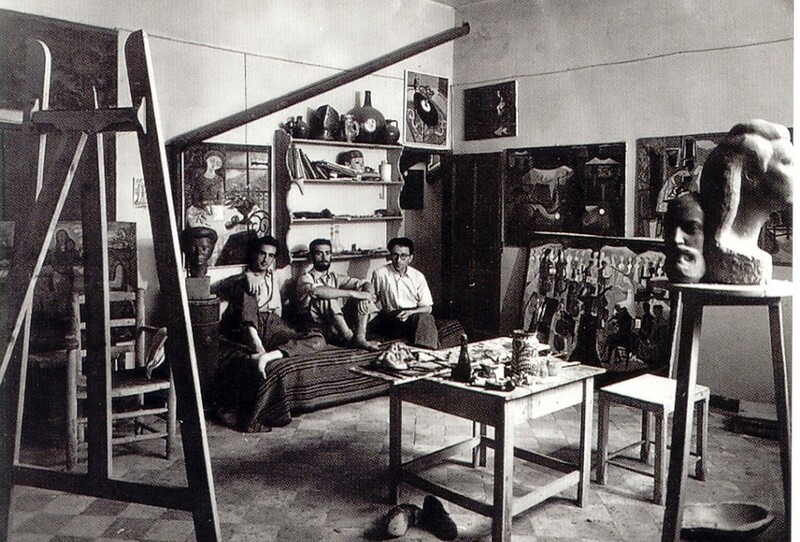 He also had a larger studio at 6, Calle Fernanflor where he painted his larger canvasses. During the se years, José moved from billboard painting to teaching drawing, first at the Colegio Santiago Apóstol and then at the French Lycée. He was awarded the Pensión Paular to study landscape painting and Hans Bloch, a German expressionist he had met in Granada in 1935, introduced him to Karl Buchholz, who was soon to become one of the first gallery owners to show his work. At the request of Professor Eduardo Chicharro in Madrid, the Diputación de Granada also awarded him a grant at this time. On completing his studies in Fine Arts and thanks to a grant from the French government, Guerrero went to Paris in 1945 to study painting in fresco at the École des Beaux Arts. He stayed at the Spanish pavilion at the Cité Universitaire where he coincided with his friend Antonio Lago, among others. It was here he saw at first hand the work of the Spanish painters of the Paris School and the French avant-garde and was especially impressed by Matisse. He was profoundly influenced by his discovery of contemporary art. He was certain that, from then on, he was going to create such art, but that the vocation he felt could not be realised in Spain. This lead him on a three year-long search in the personal, the professional and the aesthetic, travelling intensely throughout Europe at a crossroads in its history, when the few remaining masters of the most progressive art were hard to approach. 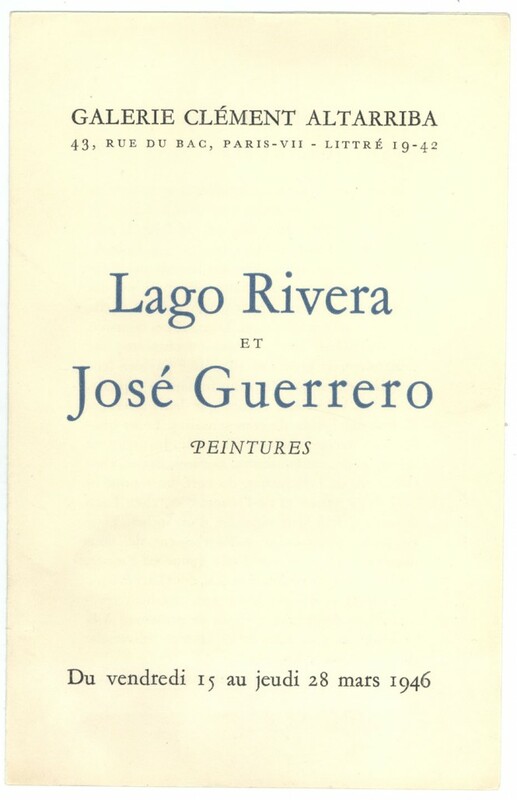 Leaflet from the exhibition by Lago and Guerrero in the Clément Altarriba Gallery in Paris, 1946. 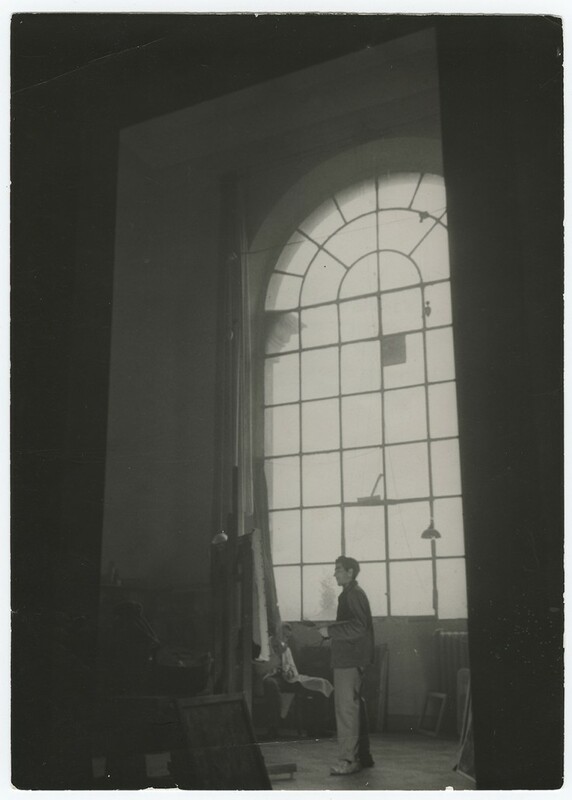 Guerrero in the Academy in Rome, 1947. «I had the first symptoms of phobia in Rome […] I became terribly anguished…, I thought I was dying…, I couldn’t breathe, I went white […], I got back to the Academy in quite a state and…, there’s something serious wrong with me…, and I had to leave Rome in a terrible state.». After spending the summer between Huy (Belgium) and Brussels, he moved back to Paris in autumn 1948, staying again at the Colegio de España, where he coincided with Palazuelo, Chillida, Abel Martín and Sempere. He then painted a series of pictures, later destroyed, on the theme of the underground, some others called “Lorquian” by Juan Manuel Bonet and the first attempts at semi-abstraction (such as Hilandera). On 25th April 1949, Guerrero married Roxane and they travelled to Spain to honeymoon and meet his mother. In autumn the newly-weds moved to London. Roxane and José’s brief stay in London was for purely practical reasons, so that he could begin to learn her native language. However, José continued to paint and even showed some of his pieces at a joint exhibition with Hortense Kelly in the St. George’s Gallery. Roxane and Guerrero on their wedding day in Paris, 1949. 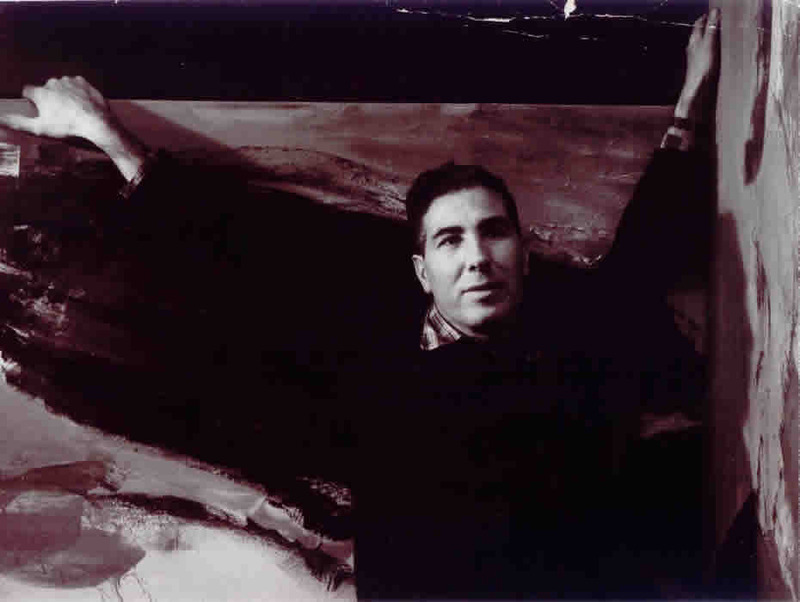 Guerrero working on a mural painting, New York, 1950. 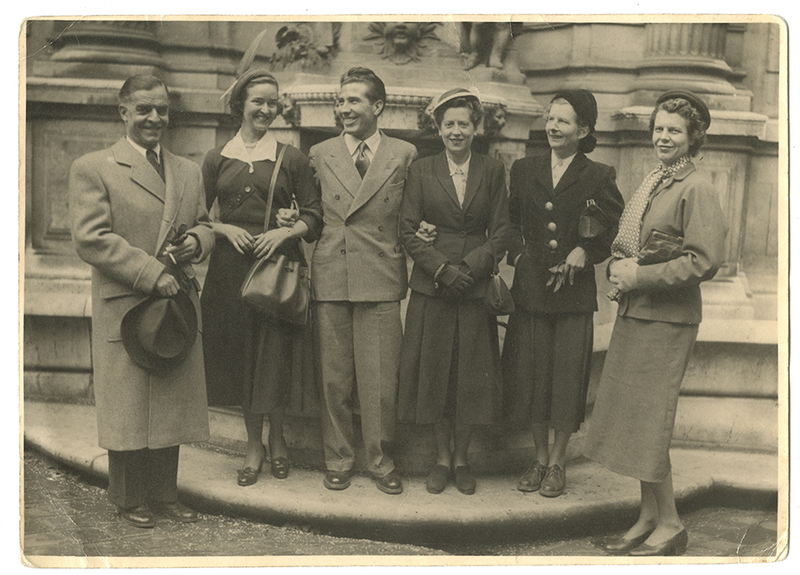 Shortly after the closure of the London exhibition, the Guerrero family took the great leap and left for the USA in November 1949. They first went to Philadelphia to stay at Roxane’s parents home and then, in 1950, moved to New York, where they found a place to live on Morton St. (Greenwich Village). As if to bring to a close his difficult formative years, at the age of 36 José Guerrero painted a self-portrait, which was to be the last of his figurative pictures. he then resolved to paint his first rigorously abstract works, while further experimenting with new materials applied to mural painting. He set up a studio on Spring St. (Soho) and in the summer they rented a house in Martha’s Vineyard (Massachusetts), where they were to spend the summer in the following years. Meanwhile, Roxane had begun work in the Art Department of Life Magazine. In 1951 they moved to West Fourth St. and in 1953 José Guerrero acquired US citizenship. Shortly after settling in New York, José went to see the influential gallery-owner Kurt Valentin with a letter of introduction from Karl Buchholz and Valentin sent him to Betty Parsons, one of the most important dealers in works of the recently formed new York school. Through Parsons, Guerrero met several of the most outstanding painters of the time, with some of whom he was to form a close friendship (Steinberg, Rothko and Lindner, first, then Motherwell and later Kline). 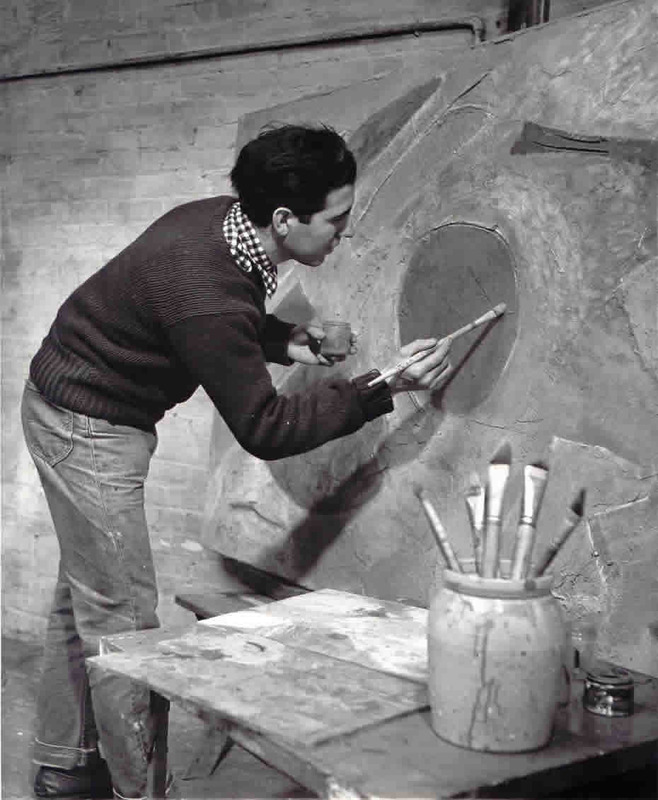 He learned engraving technique with Stanley William Hayter at the prestigious Atelier 17. He also met the García Lorca family and other exiled Spanish intellectuals. He also became friendly with James Johnson Sweeney, the Director of the Solomon R. Guggenheim Museum, who showed great interest in his mural work. It was through the latter’s intercession that Mrs. Shaw offered José the opportunity to exhibit at the Arts Club of Chicago together with Joan Miró. 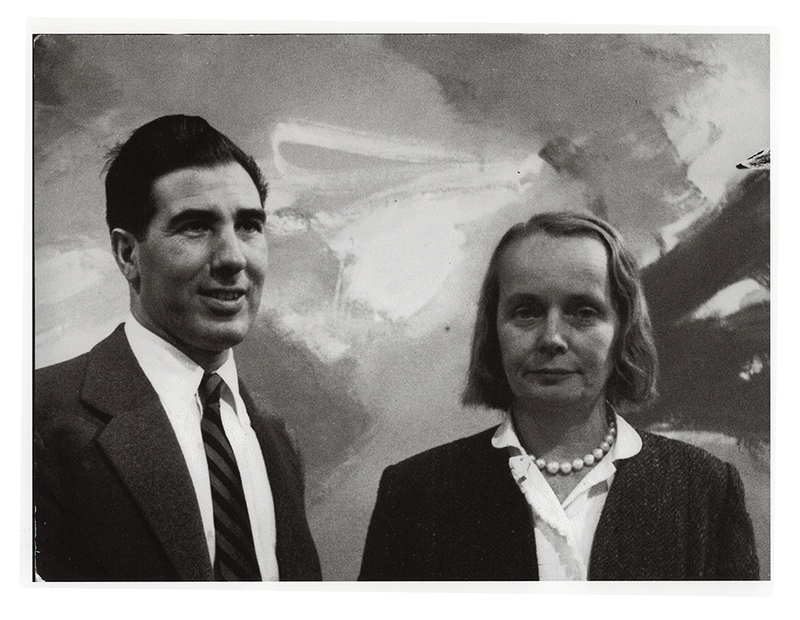 Guerrero and Betty Parsons at his first exhibition in the Betty Parsons Gallery, 1954. The Guggenheim’s purchase of one of José’s portable murals and then the exhibition in Chicago with Miró finally awoke Betty Parson’s interest in his work and so, convinced of his possibilities, she held Guerrero’s first one-man show in the US and signed him on as one of her artists. José had finally found his place in the world of art. On several occasions José Guerrero said that he felt as if he had a double or ambivalent destiny. We have seen how that feeling could be said to fit his life in the year 1935, for example, but he was mainly referring to the year 1958. Indeed, as the culmination to the social recognition he was beginning to enjoy and in return for his already solidly established artistic career, the Graham Foundation awarded him a prestigious grant to take part in a joint project for architects, painters and philosophers “to see how the city of Chicago might be remodelled” (other awardees were Wilfredo Lam, Chillida and Mies van der Rohe). However, the very day he was notified of the award, he was told of the death of his friend Carlos Pascual de Lara. In mourning, therefore, he went to Chicago to find, apart from the attention merited by such an ambitious programme, long working days in which he forced himself to struggle on, although his state of mind finally took the toll. After so many years, when he was finally beginning to see the fruits of all his labour, his inner life collapsed and he was obliged to undergo psychoanalysis. The crisis was brought about by the stress of his activity in Chicago, where he was advised to see a psychiatrist and José, who already knew of the benefits of such treatment from some of his colleagues, accepted. He put himself in the hands of Dr. Richter (5th Avenue with 96th) for a course that lasted four years and which should be studied in more depth than it has up to now. The fact is that, apart from overcoming his anguish and achieving greater personal well-being, Guerrero also gained a great capacity for analysis that he was to apply thereafter to his own work, allowing him to develop his feeling for plasticity with enormous lucidity. After psychoanalysis, Guerrero travelled to Spain alone in order to make an intimate evaluation of its results. In Madrid, he promised to provide work for a new gallery to be opened by Juana Mordó, who wanted Guerrero to inaugurate it. He then returned to America. It was 1963 and the date was to mark a series of paintings with Spanish titles: Generalife, Calvario, Alpujarra, Sacromonte, etc. The following year, after a collective exhibition containing some of his work, the Juana Mordó gallery gave its first one-man show with picture by José Guerrero. In 1965, he returned with his family to Spain, where they stayed for three years at 50, Paseo de la Habana, Madrid. 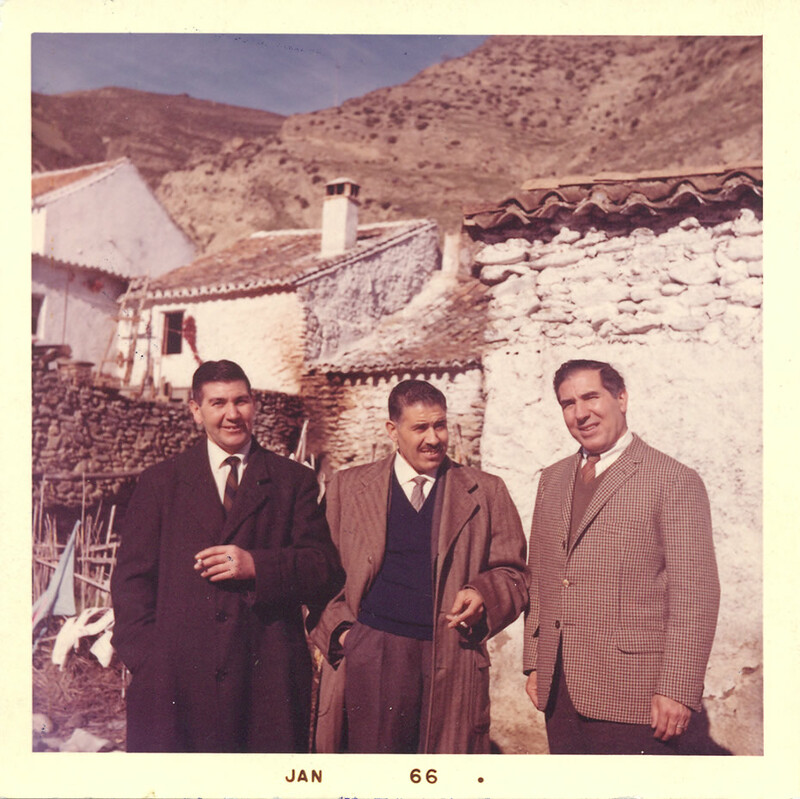 Eduardo, Rafael and José Guerrero in Pinos Puente, Granada, 1966. During their 1965 stay in Spain, the Guerreros bought a house in Cuenca, at the time one of the most important centres for contemporary art. As with so many other artists of his generation, this took place thanks to the intervention of Gustavo Torner. The Spanish Museum of Abstract Art was about to open and the Cuenca group wanted to concentrate in the city the most dynamic part of the most dynamic art of the moment. In Cuenca, apart from Torner, José became friendly with Fernando Zóbel, Gerardo Rueda and Manolo Millares and met up again with Eusebio Sempere. He was present at the inauguration of the Museum, whose collection then contained his Barrera con Rojo and Ocre y Rojo Sombrío. In 1967 Juana Mordó published his Six Engravings folder, with a text written by Jorge Guillén for his painter friend. 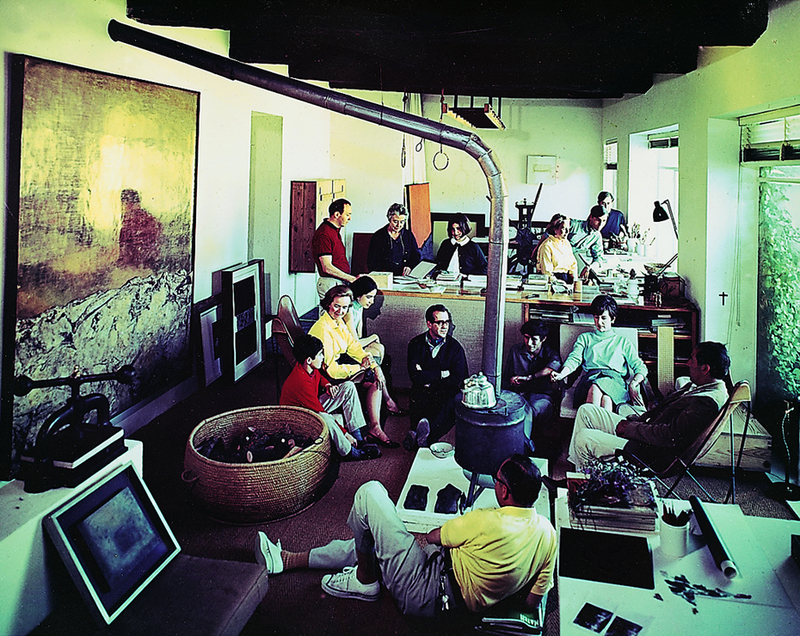 The Guerrero family with Zóbel, Rueda and Torner, among others, in Torner’s studio in Cuenca, 1966. During their mid-1960’s stay in Spain, the Guerreros also bought a house in Nerja. In the summer of 1965, they travelled to Andalusia where, among other things, they visited the Barranco de Víznar, where José made numerous figurative notes that were later to culminate in La Brecha de Víznar, a painting of utmost importance in his career, and Roxane sketched a report for Life on the 30th anniversary of the death of García Lorca, published on 29th August, 1966 and profusely illustrated with photographs by David Lees, under the title “The Spain that Fed García Lorca”. It was just the closeness of old friends such as the García Lorcas or the Giner de los Ríos, who had a home in Nerja, that decided the Guerreros to buy the San José farm on the road from Nerja to Frigiliana. From this time on they would spend their summers between this farm, near Granada, and Cuenca. The Guerrero family returned to New York, although they returned to Spain every summer. In 1976, the year of the death of Guerrero’s mother, José rented the same studio that had been used by Carmen Laffón at Serrano, 93 in Madrid, and that same year held his first anthological exhibition in Granada at the rooms of the Banco de Granada and the Fundación Rodríguez Acosta. In all there were 54 canvasses, including some of those painted in the early 1940’s. The selection was the work of Miguel Ángel Revilla and Miguel Rodríguez-Acosta and the catalogue contained a text by an old friend – Miguel Olmedo. The first review of the exhibition, by Juan Bustos, appeared in the Patria newspaper and was followed by a large number of articles by José María Moreno Galván, Miguel Logroño, A. M.Campoy, José Ladrón de Guevara, Santiago Amón, Mateo M. Revilla Uceda and José Marín-Medina, as well as an interview with the painter by Justo Navarro and José Carlos Rosales. 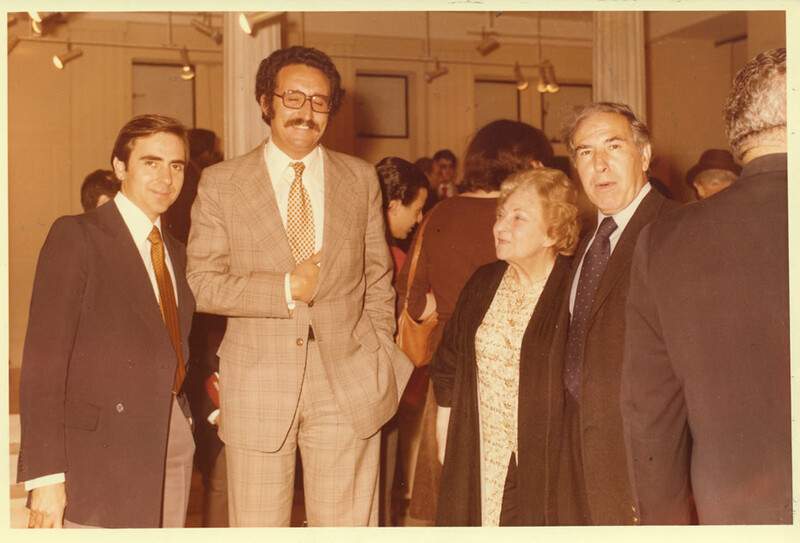 Guerrero with Juana Mordó at his first anthological exhibition in the Fundación Rodríguez Acosta and the gallery of the Banco de Granada, 1976. Also in 1976, coinciding with his stay in Granada due to the exhibition, Guerrero attended the Tribute to Federico García Lorca in Fuente Vaqueros, to which RTVE dedicated a programme directed by Paloma Chamorro. This was the beginning of José Guerrero’s so-called second youth. Indeed, from then on and throughout the 1980’s, he was to be a master to many grateful young artists and his social presence in the early years of enthusiasm for democracy in Spain grew continuously. Guerrero in his exhibition at the Sala de las Alhajas, 1980. 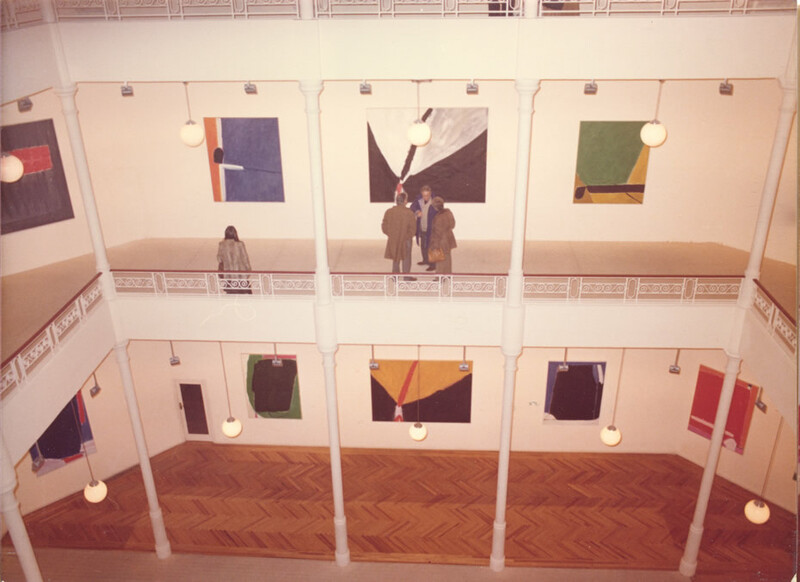 The exhibition inaugurated on 15th December 1980 in the so-called “Sala de las Alhajas” in Madrid (produced by the Ministry of Culture and the Caja de Ahorros de Madrid and curated by Juan Manuel Bonet) represented the definitive accolade in the recognition of Guerrero as one of the principle references in contemporary Spanish painting. It was also historically the most influential of his exhibitions, accompanied by the design of Diego Lara for the catalogue, the presentation by Marcelin Pleynet, one of the most important international critics of the time, and an emblematic conversation with Pancho Ortuño, in which Guerrero offered the testimony of his experience with charming spontaneity to an outstanding member of the young generation of painters that had always seen him as an example to follow. 1984 was a year of intense activity for Guerrero, in which he participated in the commemorative folder for the 5th Centenary of the birth of Bartolomé de las Casas and created the New York – Madrid suite (9 etchings and engravings published by Estiarte and four serigraphies for Bon à Tirer), provided pieces for several publications, made the poster for the fiftieth anniversary of the première of Yerma in Madrid’s Teatro Español, directed a workshop on contemporary art for the Círculo de Bellas Artes and gave a lecture at the seminar Art seen by Artists, organized by Francisco Calvo Serraller in the Palacio de la Magdalena in Santander and was awarded the Gold Medal of Fine Art. In the midst of this frenzy of activity, Guerrero, who had just gone through the unpleasant experience of a colon operation, only held one solo exhibition at the Palace gallery, between the Buades stand at ARCO and Juana Mordó’s at FIAC. While preparing for this one-man show he travelled to Granada during the Corpus Christi festivals and met with a group of young admirers from the city to talk about his life. 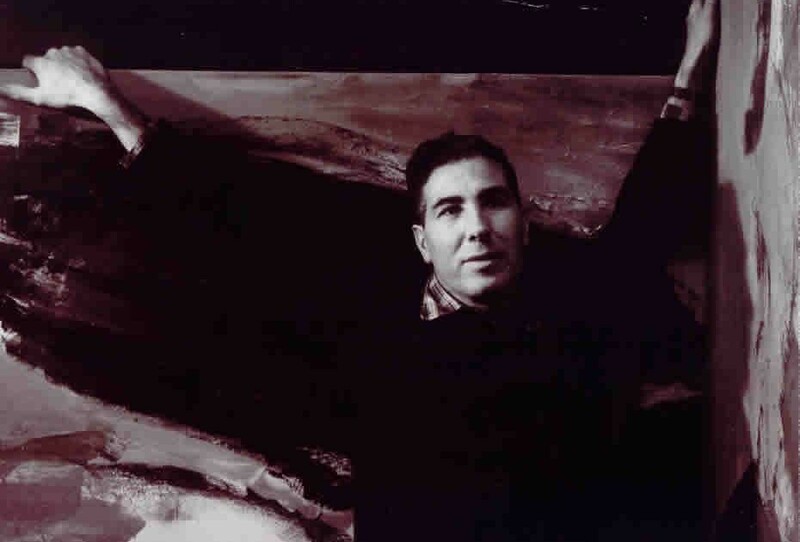 A little earlier, in May, Pilar Rubio had published an interview with Guerrero in Lápiz and a little later, in July, the magazine Buades published a conversation between Guerrero and his fellow painter, Carlos Alcolea. 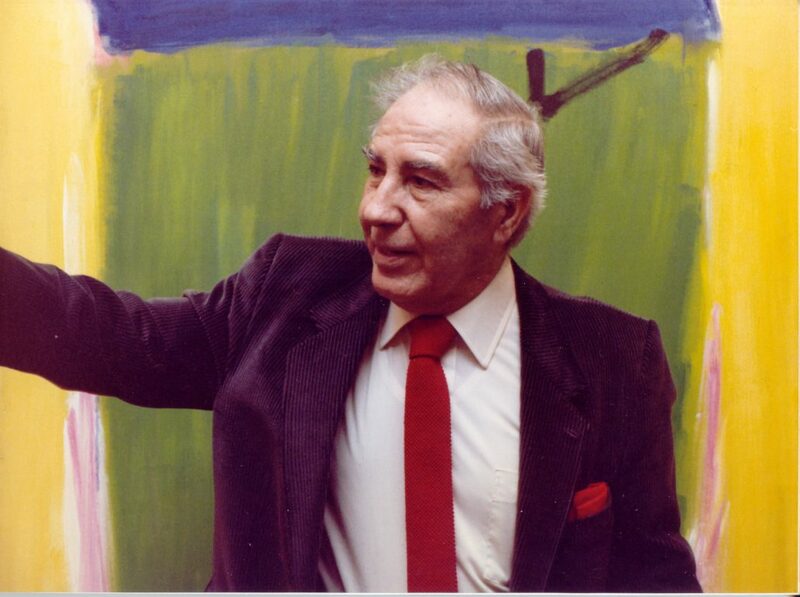 Guerrero in the Juana Mordó Gallery, 1986. 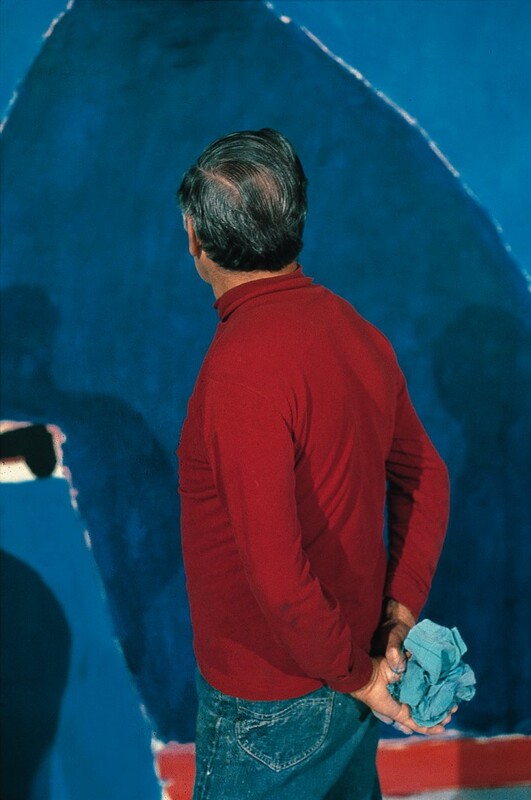 Guerrero contemplating his recently finished work at the recording of the television programme Trazos (1977). View of the façade of the José Guerrero Centre. In 1988 the Plastic Arts Committee of the Diputación de Granada told José Guerrero of its interest in setting up in Granada a permanent exhibition of part of his personal collection. The Town Hall invited the artist to visit the Colegio de Niñas Nobles, a building that was initially considered to hold the José Guerrero Centre of the Diputación de Granada. During the visit both parts continued to show their mutual interest in the project, but the advanced state of the painter’s illness prevented any further progress. Nonetheless, the Diputación continued to take an interest in promoting the presence of José Guerrero in the province of Granada, as shown by the organization of an anthological exhibition of his work in the Palacio de los Condes de Gabia and the acquisition of two of his works: Súplica and Brecha de Víznar III. After the artist’s death in December 1991, his family finally accepted the plan and the Cultural Department of the Diputación de Granada began serious work on the project in 1992. Its relevance was officially recognized when, on 14th May 1993, the Diputación formally accepted the offer of the painter’s heirs, acknowledging its enormous patrimonial value. Since in the meanwhile the Colegio de Niñas Nobles had been ceded to the Euro-Arabic University, a change of building was proposed to and accepted by the family. The new site chosen was the Patria Building, that had to be rehabilitated for the purpose and had already been awarded a grant by the Ministry of Education. 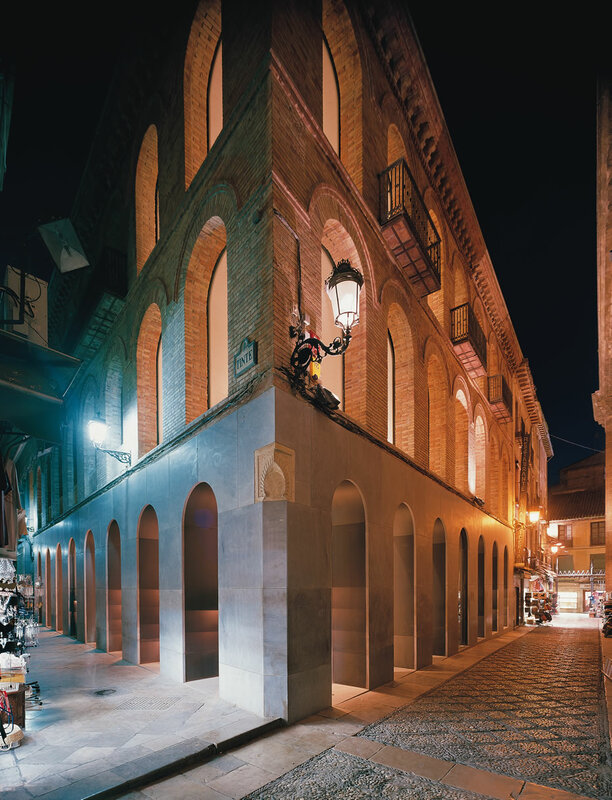 In 1995, the rehabilitation project was awarded to the architect Antonio Jiménez Torrecillas under the supervision of Gustavo Torner and the design of the museum itself to Yolanda Romero Gómez. A committee of experts on his work (Juan Manuel Bonet, María de Corral, José Mª Rueda, Eduardo Quesada and Yolanda Romero) in collaboration with his heirs proceeded to make a selection of work, consisting of 40 large-format oils on canvas from different periods of his career and illustrating the main lines of his development. The collection also contains pieces on paper and the artist’s personal archive, consisting of his correspondence, personal writings and varied material both published and unpublished. This legacy initially took the form of a fixed term deposit for ten years, on conclusion of which, in 2015, both parties agreed to maintain the aims, operation and line of work of the José Guerrero Centre by means of a new loan of use contract.